Get up close and personal with a DIYLILCNC in action! 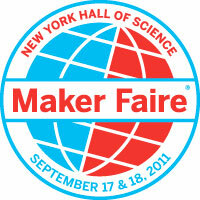 Chris Reilly and Taylor Hokanson will be running demos, answering questions, and having fun at Maker Faire NYC 2011. Saturday, Sept 17 10 a.m. – 7 p.m.
Sunday, Sept 18 10 a.m. – 6 p.m. Organized by the staff of Make magazine, makezine.com and craftzine.com, Maker Faire is a newfangled fair that brings together science, art, craft and engineering plus music in a fun, energized, and exciting public forum. The aim is to inspire people of all ages to roll up their sleeves and become makers. This family-friendly event showcases the amazing work of all kinds of makers – anyone who is embracing the DIY spirit and wants to share their accomplishments with an appreciative audience.